A major injury or surgery can be a life altering event. For some, it could derail an existing workout routine, for others it could make getting into shape nearly impossible. For Bob, however, a knee replacement surgery was the catalyst that propelled him into the best shape of his life. A year and a half ago, Bob had a complete replacement surgery on his left knee.“After all of the years of sports and work, the knee just fell apart,” says the 59 year-old contractor. His doctor recommended Bob lose a few pounds and get into shape to increase the chance of a successful recover after the surgery. Bob credits his personal trainer, Justin, with helping to fill in the holes in his workout routine right after his surgery. Justin helped Bob to correct his posture, showed him what muscle groups were being neglected, and how to get his body back in line. While his surgery pushed Bob towards better shape and regular workouts, it is a personal passion that continues to drive him to take care of his body. 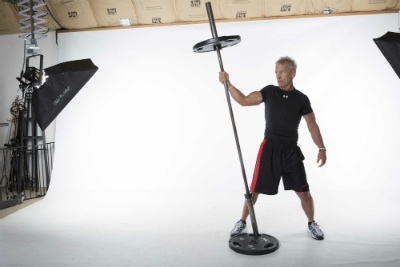 At 59, Bob admits that his workouts are only half the battle. “What a lot of people my age don't realize is a lot of it is your workout, but a lot of it is also your diet.” A high-protein, clean diet helps keep him in tip-top, motocross riding shape. Bob is a big advocate for cutting out the junk food, eating clean, and listening to your body. “Nine times out of ten, your body will tell you what you are missing. Sometimes I crave a steak. Sometimes I crave a salad.” Bob allows himself one day a week to indulge in whatever he wants, but the rest of the time he practices moderation, balance, and avoids processed foods.